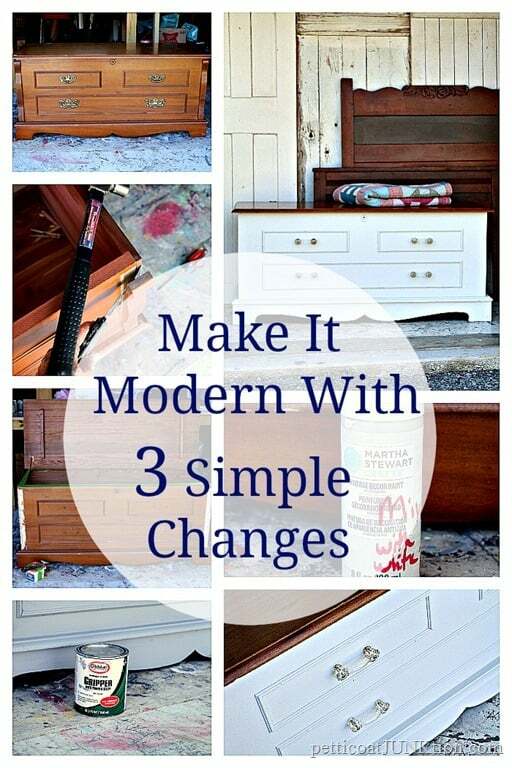 With just a few simple changes you can modernize outdated furniture. 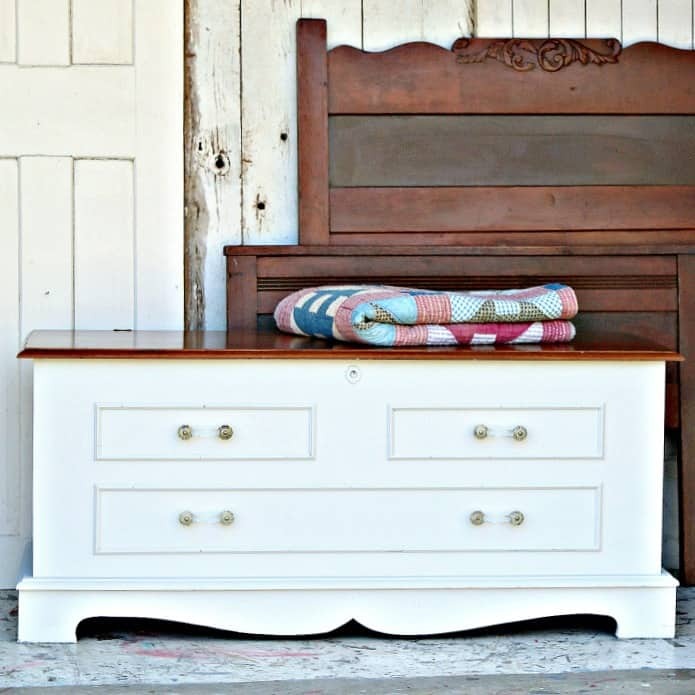 The trick to this makeover and bringing the cedar chest into the twenty first century was removing a couple of curvy details, changing the hardware, and showcasing the original finish. The cedar chest never looked better. 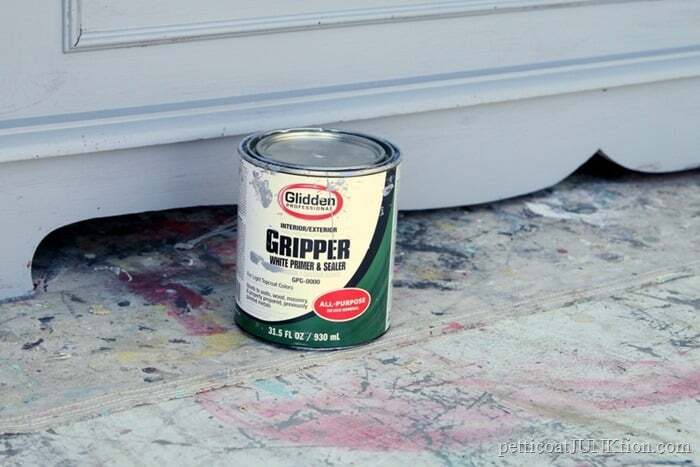 A coat of white or whitish paint freshens anything. The new knobs are a definite improvement over the original. I bought the cedar chest at an auction. It cost me $50 by the time the buyers premium was added to my final bid. A little pricy for my budget but it’s a great piece. You guys might have noticed the curvy details on each end of the front. Take a look at the before picture again. Those things were driving me nuts so I took a hammer, putty knife, and screwdriver and got rid of them. I think they really dated the piece. I’m not crazy about the curved bottom panel either but I left it as is. I removed the original hardware (never to be seen again), puttied the holes where I removed the end pieces, and stuck painters tape where I didn’t want yucky looking paint edges. 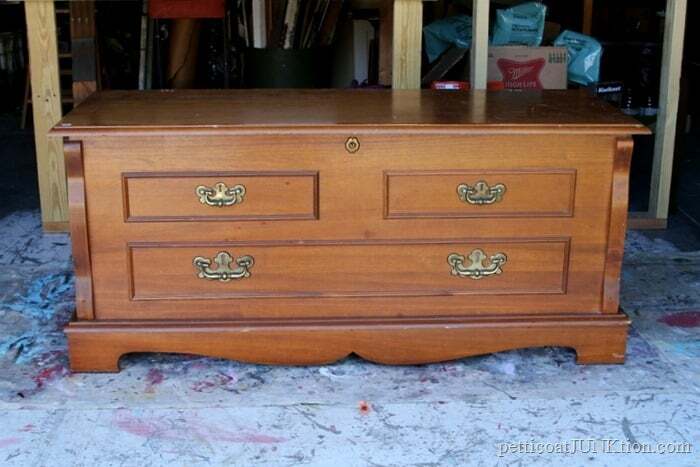 When painting a chest like this you can either paint the top edge of the chest or not paint it. I chose to not paint it. I decided to prime the chest since the raw wood was such a sharp contrast to the stained finish. This way I had a solid uniform color base for the top coat. 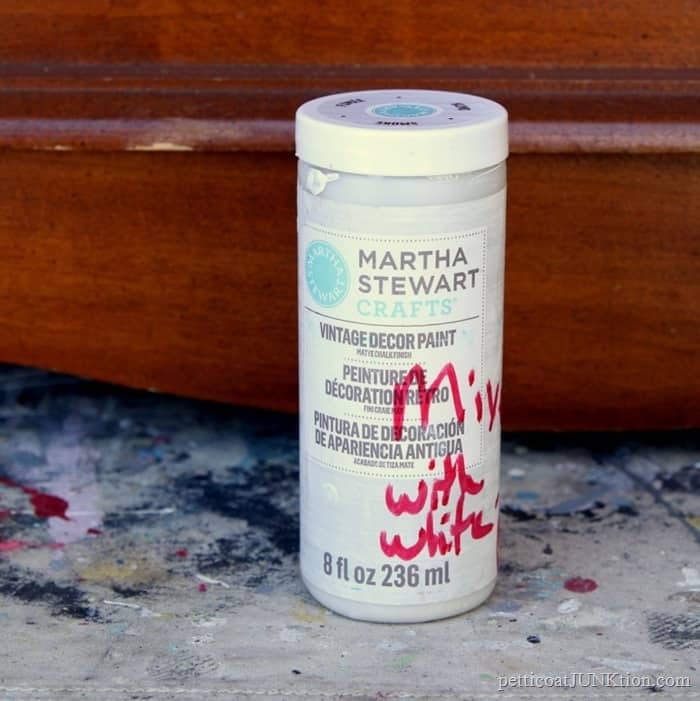 The topcoat/paint is a mixture of Martha Stewart Vintage Décor Paint in Wedding Cake and Smoke to make just the palest gray color. 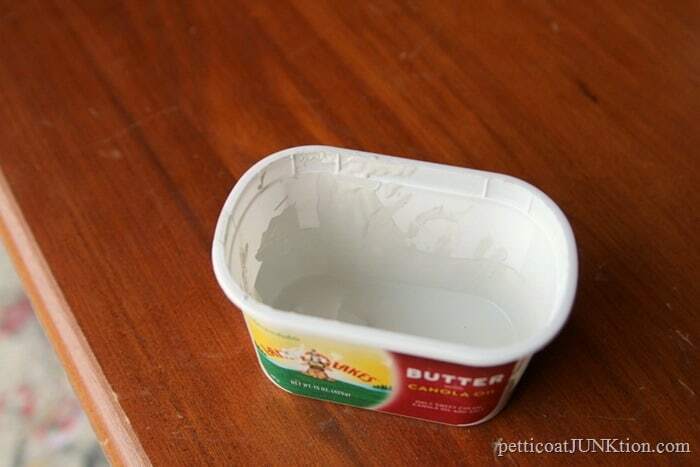 In fact it looks white until you take a look at the paint in a white container. Have you guys ever tried to pick out a white color for your walls? I think there are as many shades, tones, variations of white as there are stars in the sky. Two coats of the gray and I was finished. Next order of business was to select new knobs to replace the original ones. I first thought I would go with a French Provincial look and pulled out all my French Provincial hardware that would fit the screw holes. No need in drilling more holes and filling old ones unless I had to. When I held the knobs up to the chest after it was painted they looked …..not good. The style just wasn’t working for the cedar chest. 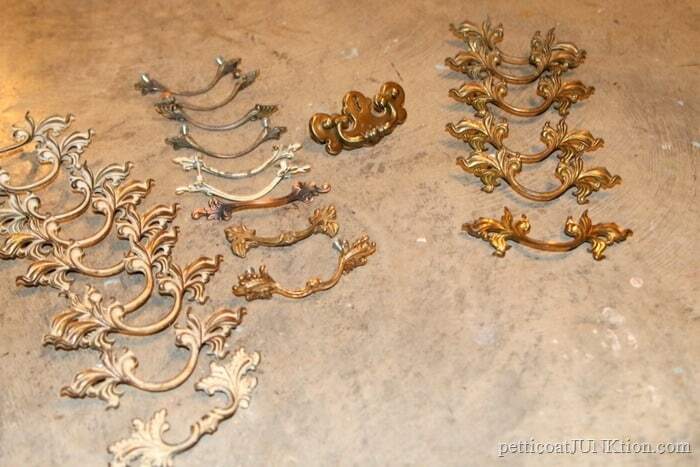 I found four more pulls and spray painted them a bronze gold….no go …..no photo either…..sorry. I was about to give up and head to Hobby Lobby to see what they had when I thought about the glass knobs. I bought them at my favorite junk shop a few months ago not knowing if I would ever use them. I just didn’t see them working on any furniture I would paint. Well, I was wrong. They definitely look modern but also a bit feminine. I like them! What about you guys? Let’s take another look at the before and after side by side. I think the chest looks 200% better. The top was in such good shape I was able to just spruce it up with Howard’s Feed n Wax. There was nothing difficult about this project. It was easy to remove the end pieces, change the hardware, paint the chest, and clean up the top. Anyone can do this. 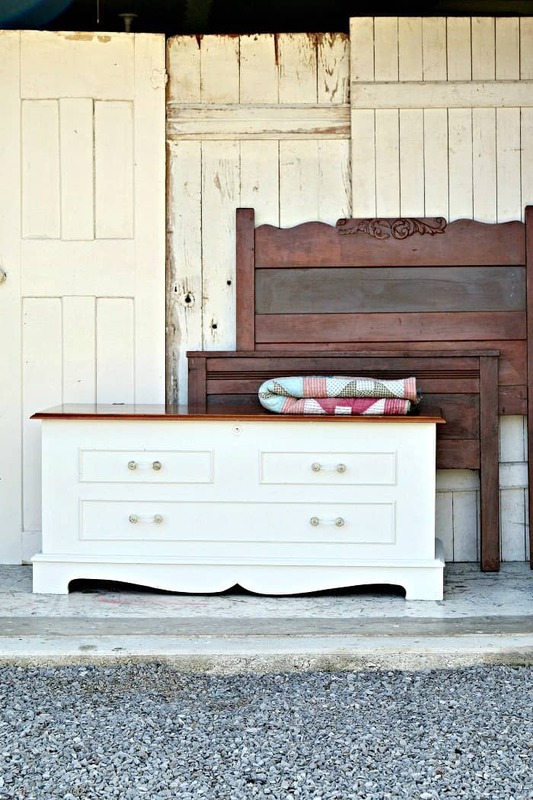 Did you read my tips for painting your first furniture project? That’s it for me. Hope you guys liked this project. Any thoughts? 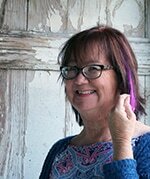 Find the Howard’s Feed n Wax and all of my favorite products on the Petticoat Junktion Amazon page. (Amazon affiliate link, read disclosure here). Wow, beautiful. Thanks for the tips for beginners painting of furniture. I love tge drew pulls to. The chest is beautiful painted white. I really like the glass handles that you chose too! That was a great transformation. I dislike brown, and the new color gives it such a modern and dynamic look. Are you sure the old pulls were unusable ever again? What if you were to paint them in a racy shade of turquoise or orange? Oh, I still have the pulls. They will probably show up somewhere eventually. Just not as they are now. There’s that white paint again! It transforms almost every thing into a special piece. You did a good job on this piece, Kathy. It seems like a piece that could go with lots of different decorating styles. Especially since you got rid of those curvy pieces. So do those pieces have any potential for re-use, do you think? Thanks for this post; it’s a good tutorial. I kept the curvy pieces but can’t think what I would possibly use them for!! What a great tutorial. Such simple changes make a world of difference. Thank you so much for showing us how to transform and update outdated furniture pieces. 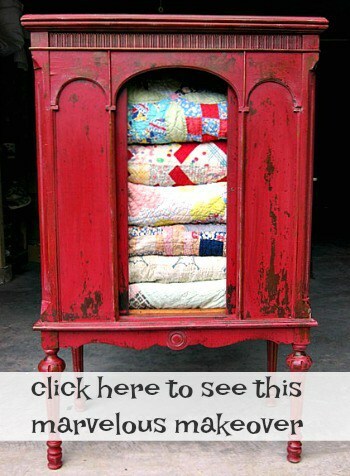 This makes me want to run right out and buy an old hope chest to paint! Thanks Bonnie, and you are welcome. Go buy something to paint! 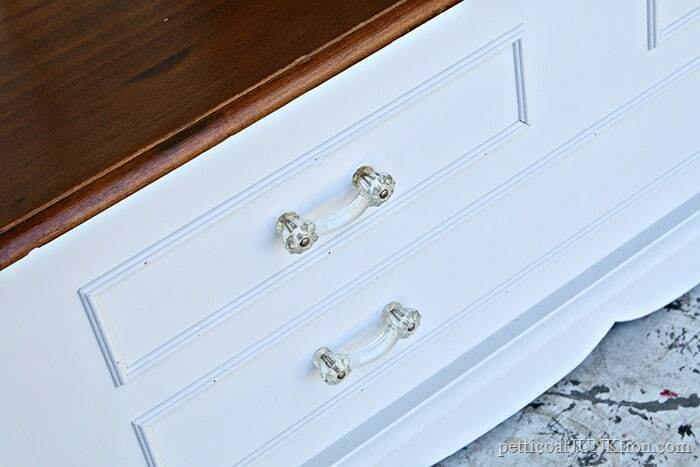 What a pretty piece, love the glass knobs. Good Job! Lovely transformation. The handles pulls are beautiful! Great job Kathy! Would not have ever envisioned it could look so good, but that’s why I am glad we have you! Glad the old hardware will never be seen again! Another inspiration! What a remake! Love those new pulls and the white color is so refreshing. 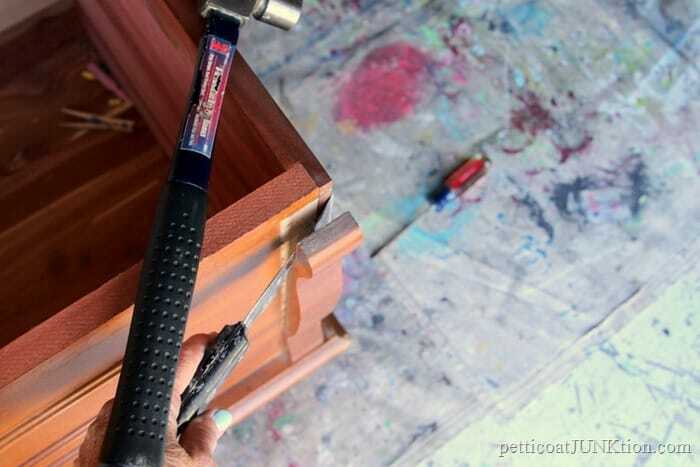 I really like using stain and paint on a piece of furniture. You did a great job, Marie. I know, I love the two tone furniture! LOVE LOVE LOVE this!!! 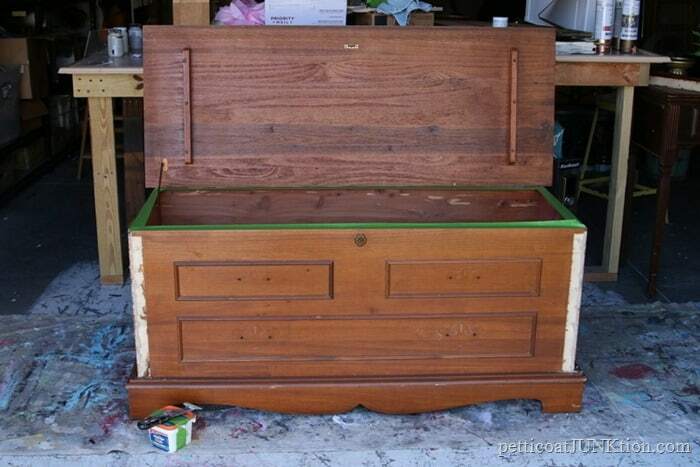 Have a cedar chest sitting in my living room waiting for me to make up my mind how I wanted to refinish it!!! This is it!!! Can’t wait to get home and rip off those wavy things–been staring at them for months!!! One questions–where do I find Howard’s Feed & Wax?